The full 54 minute version of this documentary is now available for sale on DVD. Click here. Click here to rate the film on IMDB. The King Sun was screened to a very enthusiastic audience at the Dungog Film Festival on August 31st 2014. In March 2015 the film has been selected for screening at the Byron Bay International Film Festival. Note: A 27 minute version of this film commissioned by ABC TV was screened on ABC 1 Tuesday 17th June 2014 at 10pm. At 85, one of Australia’s greatest living artists, John Olsen, embarks on his second biggest painting ever. John gave Tony Williams and Anna Hewgill of Four Donkey Films exclusive authority to make a 54 minute documentary about what could possibly be his last big mural. 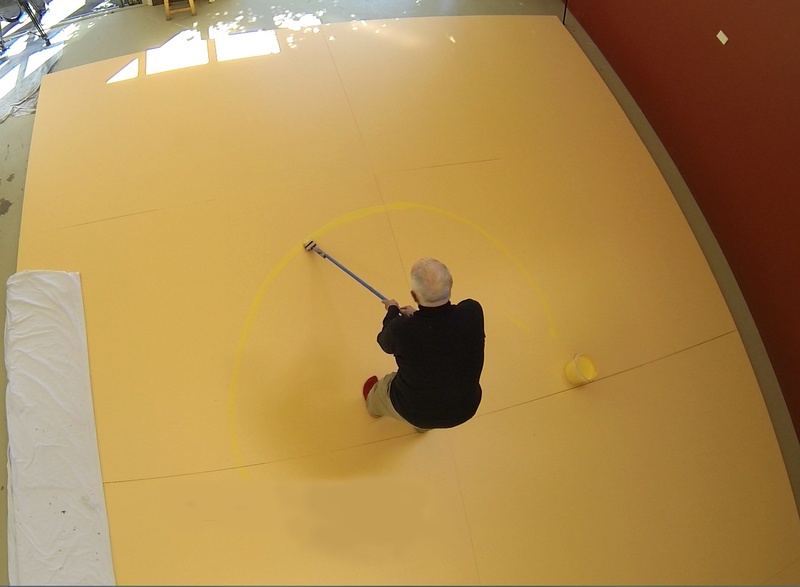 The 6 metre by 8 metre mural is second only to his Salute to Five Bells at the Sydney Opera House and was painted in Tony and Anna’s studio at Four Donkey Films. Each day’s progress has been captured, starting with the empty studio and arrival of the 8 huge blank panels. The mural, based on the sun, was commissioned by Lang Walker and has been erected in the new $1.3 bil. Collins Square project in Melbourne. This mural is so large, Olsen had to stand on a series of 8 wooden panels and use brushes attached to long sticks to paint. 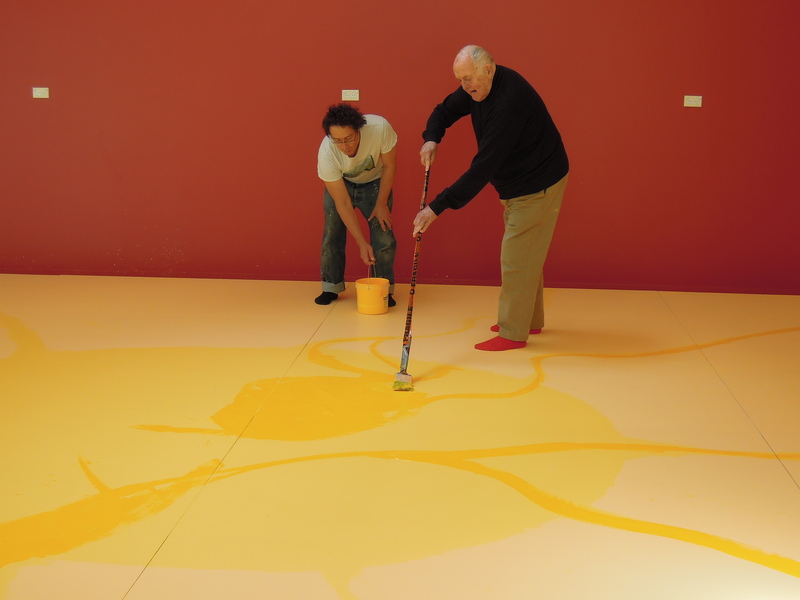 He needed an assistant, Carlos Barrios and Ken McGregor to hold his hand and support him while he painted. He became very tired and needed to sit often to rest. At one point the completion of the mural is threatened when John collapsed and was taken to hospital. In the course of the film, John reflects on his life, his mortality, the sun, the landscape where he works, and how it feels to be in his 80’s. We follow the progress of this work, from arrival of the blank panels, to the delivery and installation in Collins Square Melbourne. 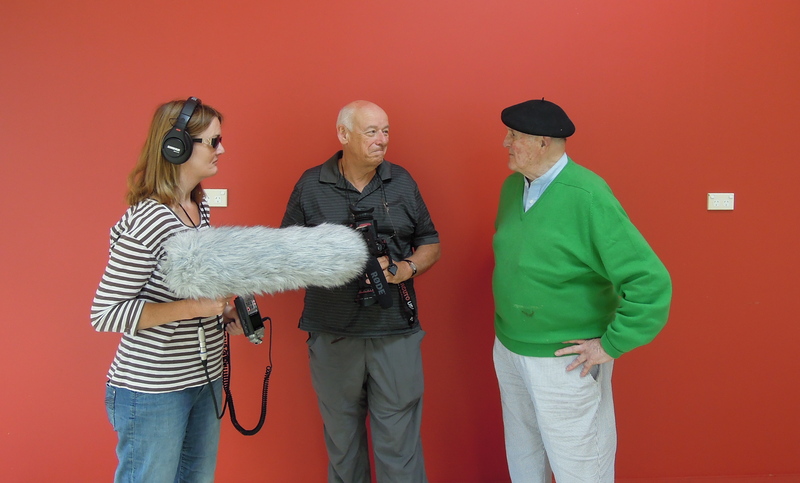 This film is an emotional journey, and a valuable portrait of John Olsen at 85. Keep up the good work John, if it doesn’t leave something in you, then you can’t take it with you. You’re an inspiration, still breathing fresh life into your work. Wonderful film. Hoping you can please tell me the composer and performer of the beautiful violin music played throughout? I think perhaps it was a Peter Sculthorpe quartet but not sure which one. The credits were a bit quick for me to catch.